Stop being a member of the throw-away society and be part of the sustainable solution. 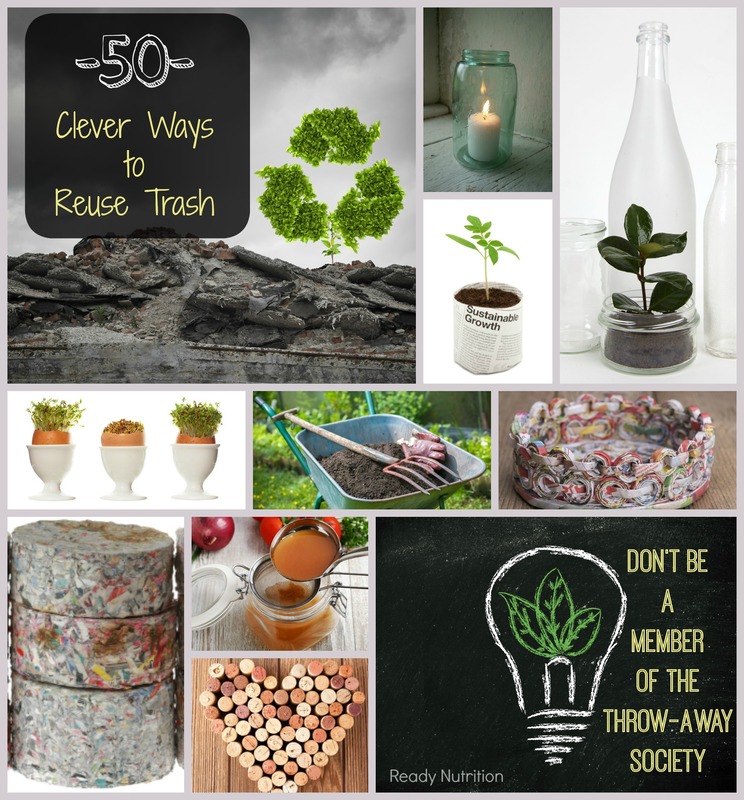 Here are 50 of the most thrown away items and clever ways to reuse them. Small changes can make big impacts. One way we can all minimize the amount of trash that comes into our homes is simply going paperless. You can use technology as a way to reduce your paper hoard. Investing in a scanner, a paper shredder, flash drives and even investing in online filing system can help you take the necessary steps to reducing your trash load. Plastic liter soda bottles – This is a very versatile trash item that can be utilized in multiple ways. You can make self-watering pots, grow onions, make a homemade fly trap, and even create a drip irrigation system for your garden. You can also reuse them on the homestead to bottle feed baby livestock. Papers from school or homework – If you can’t go paperless, consider shredding paper and using it in litter boxes or added to compost pile. Note: Keep your earthworms happy and ensure that the ink is soy-based. Cardboard soda case – Build a can rotating rack, or make some fun pencil cases. Glass jars – Aside from making great pens holders, they can also be repurposed to store shelf stable foods, used to store ribbons, turned into candle holders or outdoor lanterns. You can also use them to regrow vegetables or get plant cuttings started. Check out these 14 ways to reuse glass jars. Newspapers – Because newspaper is made to absorb ink, it is great for absorbing all types of moisture. Crumbling newspaper and placing them in wet shoes can help dry them out faster. They are also great at cleaning glass and mirrors, can be used to make biomass, added to the compost, fashioned into paper pots for seedlings or the garden for lasagna gardening methods. As well, save your newspapers for packing material too. Baby food jars – You should hold onto these little jars. There are so many uses, it would be difficult to list all of them. Aside from craft and storage ideas, baby food jars can be rewashed and used to store homemade baby food. Make homemade candles for the outdoors, or use them to store spices, seed planter. They can also be great for painting. If you are into making homemade salves, these can make great containers, as well. Stationary bikes – Did you ever think that stationary bikes could help to promote your self-sustainability? Attaching your wheat grinder to your stationary bike by a pulley will help you put the pedal to the metal and grind grains more efficiently. Here are few additional ways to produce energy using a bicycle. Your article was great and chock full of wonderful ideas! One that is not mentioned is using a washed spice jar for a dry shampoo dispenser. This can be made by mixing cornstarch with essential oil to put in your dispenser!